"Cézanne and the Modern: Masterpieces of European Art from the Pearlman Collection" at Princeton University Art Museum features more than 50 iconic works by leading Impressionist, Post-Impressionist and School of Paris artists. 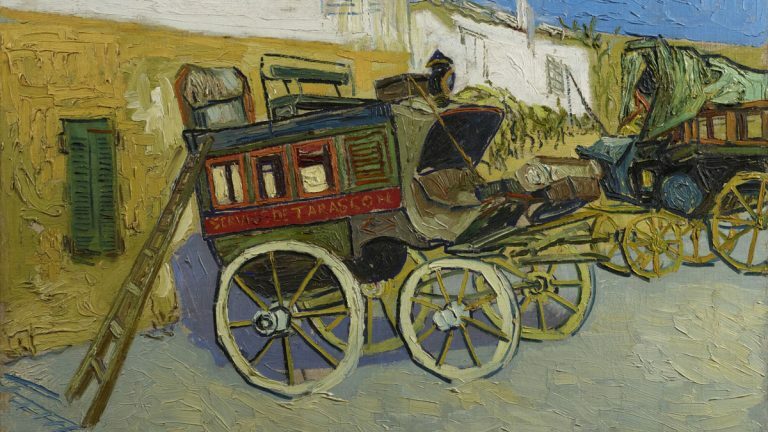 Pictured: Vincent van Gogh, Tarascon Stagecoach, 1888. Oil on canvas. The Henry and Rose Pearlman Foundation, on long-term loan to the Princeton University Art Museum. Can’t see the Pope? There’s “New Hope” and more places around the region to visit. It’s not too late to make your plans. 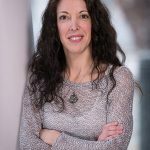 Robin Bloom shares her picks. More than 50 iconic works by leading Impressionist, Post-Impressionist and School of Paris artists from a premier private collection of a New York businessman are on view in a special exhibition at Princeton University Art Museum, through January 3. Cézanne and the Modern: Masterpieces of European Art from the Pearlman Collection features 16 watercolors by Paul Cézanne as well as pieces by Gustave Courbet, Honoré Daumier, Edgar Degas, Paul Gauguin, Oskar Kokoschka, Wilhelm Lehmbruck, Jacques Lipchitz, Édouard Manet, Amedeo Modigliani, Camille Pissarro, Alfred Sisley, Chaïm Soutine, Henri de Toulouse-Lautrec and Vincent van Gogh. Accompanied by an illustrated 320-page catalogue, published by the Princeton University Art Museum and distributed by Yale University Press, Princeton, NJ. Free. 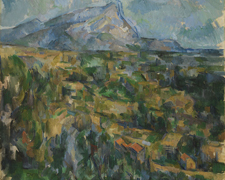 Pictured: Paul Cézanne, Mont Sainte-Victoire, ca. 1904–06. Oil on canvas. The Henry and Rose Pearlman Foundation, on long-term loan to the Princeton University Art Museum. Photo by Bruce M. White. 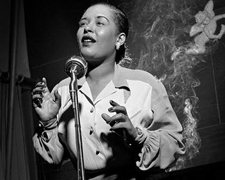 On display at the Michener Art Museum is Herman Leonard: Jazz Portraits, through October 11, highlighting images taken by the Allentown, Pennsylvania born photographer who photographed legends like Billie Holiday (pictured), Miles Davis, Duke Ellington, and many more from 1940 through 1960. On Sunday, September 27 at 3pm, Steven Weisz brings his newest international project Graffito Works (“little scribbles” of movement), a site-specific work in the outdoor sculpture garden, 138 S. Pine Street, Doylestown, PA. Pictured: Herman Leonard (1923-2010), Billie Holiday – NY, 1949, Gelatin silver print, 30 x 26 in., Collection of Kennedy Museum of Art, Ohio University © Herman Leonard Estate. The museum will be open September 26-27 and closed on Monday, September 28. 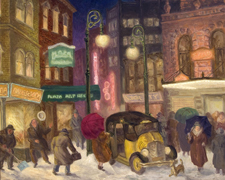 Opening this weekend at the Delaware Art Museum is Helen Farr Sloan, 1911–2005, an exhibit that showcases the art and honors the legacy of the painter, printmaker, and art instructor who dedicated most of her career to promoting the art of her husband, the realist painter and illustrator John Sloan (1871–1951). Since her death in 2005, the Museum has received a substantial number of Helen Farr Sloan’s prints, drawings, and paintings. On view through January 10, 2301 Kentmere Parkway, Wilmington, DE. Pictured: 59th Street, New York City, c. 1930. Helen Farr Sloan (1911–2005). Oil on canvas, 23 3/8 x 30 inches. Delaware Art Museum, Gift of Johannes R. and Betty P. Krahmer, 2009. While there, check out the community-curated exhibition Reconstructed Elements: Richard H. Bailey, Helen Mason, and Stan Smokler, works by three regional contemporary artists who reshape raw materials like stone, rubber tires, and recycled steel into new forms, through January 3. 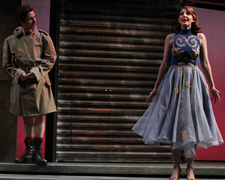 McCarter Theatre takes on Tennessee Williams’ Baby Doll, through October 11. 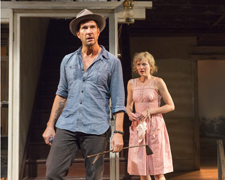 Condemned in its time for suggestive sexual themes, the controversial screenplay has been co-adapted and directed by McCarter Theatre Center Artistic Director Emily Mann and makes its American premiere starring Dylan McDermott, Patricia Conolly, Susannah Hoffman, Robert Joy, and Brian McCann. The original screenplay of Baby Doll was created by Williams using elements from two of his previous one-act plays – 27 Wagons Full of Cotton and The Long Stay Cut Short (or The Unsatisfactory Supper) – and was directed by Elia Kazan, garnering both praise (four Oscar Nominations) and condemnation (there was a successful campaign by the Roman Catholic National Legion of Decency to ban it) for its subject matter upon its release in 1956, Berlind Stage, 91 University Place, Princeton, NJ. Related programs and events include post-show discussions on specific dates, Pride Night, ASL Interpreted performance, and talks led by the artistic staff 45 minutes before any performance. Photo by Richard Termine. 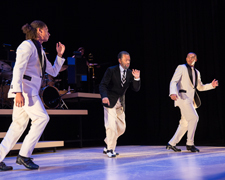 Maurice Hines is Tappin’ Thru Life at the Delaware Theatre Company. The dance legend pays tribute to his brother and longtime dance partner, the late Gregory Hines, as wells as others, including Ella Fitzgerald, Frank Sinatra, Duke Ellington, Lena Horne and Judy Garland, and more. The high energy musical is directed by two-time Tony Award-winning director Jeff Calhoun and features a new generation of tap dancers, The Manzari Brothers, and music by the all-female big band Diva Jazz Orchestra, now extended through October 11, 200 Water Street, Wilmington, DE. Related programs and events include talkbacks after the show with cast and Viewpoints pre-show talks. Photo by Matt Urban: Mobius New Media. 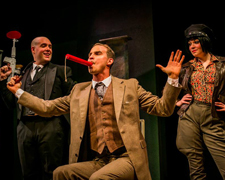 Laugh your way through Bullshot Crummond, a takeoff of Bulldog Drummond – a pulp-fiction character of the 1930s – onstage through October 11 at Hedgerow Theatre. The madcap parody recreates movie special effects on stage with rapid-fire costume changes, slapstick, bizarre and unlikely events. Starring Brock D. Vickers as Bullshot Crummond, with Josh Portera, Allison Bloechl, and Mary Beth Shrader. Directed by Matt Tallman, 64 Rose Valley Road, Media, PA. Photo courtesy of Hedgerow Theatre. Descend into a mythical, magical underworld with Sarah Ruhl’s fantastical reimagining of the classic Greek myth Eurydice at Villanova Theatre. Directed by James Ijames, the whimsical production is set in the mid-twentieth century and emphasizes a strong female voice, reassigning the original narrative of the classic Orphic myth from the male voice to the female heroine in a poetic retelling of the iconic work, through October 4, Villanova University’s Vasey Hall, Lancaster and Ithan Avenues, Villanova, PA. October 1 is Speaker’s Night, offering a post-show discussion with the director, cast, and crew. Free parking in VU’s main lot. Photo by Paola Nogueras. 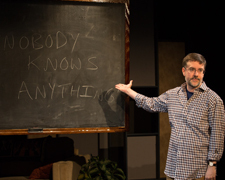 Laugh out loud at Act II Playhouse with According to Goldman by Bruce Graham, already extended through October 11. Act II Artistic Director Tony Braithwaite plays Gavin Miller, a screenwriter-turned-professor attempting a comeback in Hollywood, with Susan Riley Stevens as his wife and Luke Brahdt as his student. Directed by David Bradley, 56 E. Butler Avenue, Ambler, PA. Photo by Bill D’Agostino. Montgomery Theater presents God of Carnage by French playwright Yasmina Reza, the 2009 Tony Award-winner for Best Play about a playground dispute between two boys that brings together two sets of Brooklyn parents to discuss and resolve the issue. The sharp and boisterous comedy stars Nathan Foley, Charlotte Northeast, Sarah Fraunfelder and Damon Bonetti, and is directed by Jessica Bedford, through October 4, 124 Main Street, Souderton, PA. Photo by Angela McMichael. 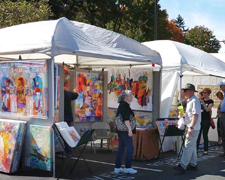 The New Hope Outdoor Juried Arts & Crafts Festival takes place Saturday, September 26, 10am-6pm and Sunday, September 27, 10am-5pm, featuring over 175 fine craftspeople from around the country offering oil paintings, pastels, watercolors, drawing, etching, mixed media, sculpture, pottery and more, New Hope-Solebury High School. Look for live music throughout the days including the Rodney Marsalis Philadelphia Big Brass Band, September 26, 2pm and 8pm. Check out the Riverbank Beer Garden (atop the riverbanks of the Delaware at the Bucks County Playhouse), plus children’s activities, shuttles around town and more, New Hope, PA.
Head to Longwood Gardens to see Autumn’s Colors as the Waterlily Display is at its peak and the Idea Garden and Flower Walk burst with blooms. Enjoy Nightscape: A Light and Sound Experience, a garden-wide installation of moving imagery and light choreographed to original music and brought to life by the natural canvas of Longwood Garden’s plants, leaves, trees, and lakes, on view through October 31. 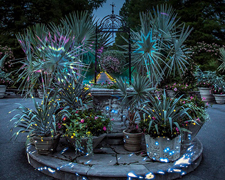 Created by Klip Collective of Philadelphia, a visual art shop bridging projection lighting, technology and storytelling, the display showcases never-before-seen views of the gardens at night at nine site-specific locations, through October 31, U.S. Route 1 near Kennett Square, PA. Photo courtesy of Longwood Gardens. Hagley Museum and Library offers free admission for two people on Saturday, September 26 for Museum Day Live! with tours and Science Saturday: Move the “Powder Keg,” family activities, 1pm-4pm, off Route 141 in Wilmington, DE. Brandywine River Museum of Art offers free admission for two people for Museum Day Live! on Saturday, September 26 and on Sunday morning, September 27, 9:30am-noon, with an opportunity to explore the exhibitions. Delaware Museum of Natural History offers free admission for two people on Saturday, September 26 for Museum Day Live! and Hibernation Celebration: DMNH and First State Ballet Theatre present Sleeping Beauty, Saturday, September 26, 12pm–2:15pm, 4840 Kennett Pike, Wilmington, DE. 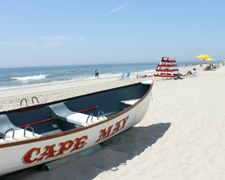 Cape May offers boat tours around the Cape, trolley tours, Fisherman’s Wharf Tour, and Lighthouse tours. Climb the Lighthouse during the day or at nighttime under the full moon (special Full Moon Climb on Sunday, September 27 from 8pm-10pm!) See the World War II Lookout Tower and learn how the nation defended the coastline during World War II. Take in an Equity theater production with “Strictly Dishonorable” at East Lynne Theater Company, “Dead Man’s Cell Phone” at Cape May Stage, or participate in an interactive mystery play, “Clueless,” in the Physick Estate. Check out the Cape May region’s wineries and brewery with tours offered daily to Hawk Haven Vineyard and Winery, Cape May Winery, Natali Vineyards, and Cape May Brewery.The Wildwood Irish Fall Festival returns September 24-27 (called the largest Irish festival on the East Coast) celebrating Irish heritage with music, dancing, food, and crafts, 8am-7pm daily. Events conclude with a parade on Surf Avenue from 20th to Spruce and Olde New Jersey Avenues, North Wildwood, NJ. Wildwood Crest Seafarers’ Celebration starts Friday, September 25, 7pm with live bands, followed by a fireworks show at 9pm. Saturday, September 26, 9am-5pm, is a festival along Sunset Lake at New Jersey Avenue between Rambler Road and Miami Avenue.The Historic Smithville Italian Festival is September 26, 10am-7pm, on the Village Greene with live music and entertainment, New Jersey wine tasting, food, artisan vendors, children’s activities, classic cars, Smithville, NJ.The South Jersey Wine and Food Festival in May’s Landing is September 26-27.The Glenn Miller Orchestra performs on Sunday, September 27, 2pm at the Stockton Performing Arts Center, 101 Vera King Farris Drive, Galloway, NJ.